Comm Eye Health Vol. 31 No. 104 2019 pp S5-S8. Published online 11 February 2019. Medical Officer for Trachoma: Department of Control of Neglected Tropical Diseases, World Health Organization, Geneva, Switzerland. Professeur: Faculté de Médecine et des Sciences Biomédicales, Université de Yaoundé I, Yaoundé, Cameroun. Neglected Tropical Diseases Team Leader: Federal Ministry of Health, Addis Ababa, Ethiopia. Data and Analytics Team Manager: International Trachoma Initiative, Task Force for Global Health, Decatur GA, USA. Harold Mitchell Professor of Indigenous Eye Health: University of Melbourne, Melbourne, Australia. Estimating the number of people with trachomatous trichiasis allows managers to plan surgical services and obtain the resources needed to eliminate this painful condition. This paper, intended for programme managers and their supporters, explains the concepts involved in estimating TT prevalence and discusses programmatic applications of that information. We hope it will help these stakeholders to use their TT data with greater confidence. 1. What does prevalence mean? The prevalence of a disease is the percentage of people in a defined population who are affected by that disease at a particular time. In this definition, it is important to clearly identify the defined population. The prevalence of TT can be estimated for a single community,13 a single administrative division of a country,14 or a whole country.15 At each of these levels, prevalence could be estimated in (for example) people of all ages,16 people aged ≥15 years,17 women aged ≥15 years,18 or some other subset of the population, such as indigenous inhabitants,19 so it is important to be clear on the group being studied. 2. At what administrative level are TT prevalence estimates usually generated? For trachoma elimination purposes, the World Health Organization (WHO) defines districts as “the normal administrative unit for health care management,” which “for purposes of clarification, consists of a population unit between 100,000 and 250,000 persons”.20 Although surveys at baseline may be conducted at larger-than-district-level in order to start the programme,20-23 it is currently recommended that impact, pre-validation surveillance and TT-only surveys are done at district level. In the real world, the term district has different meanings in different contexts. Because of this, and because the administrative level surveyed may change from one round of surveys to the next, we will subsequently refer here instead to evaluation units (EUs), a generic term for the population unit surveyed, regardless of size – even though we used ‘district-level’ (for readability) in the title of this article. Regardless of the administrative level at which EUs are framed, data should be interpreted and applied at that same level; in other words, local data should inform local action. 3. What data are used to generate TT prevalence estimates? To estimate TT prevalence, population-based surveys are recommended.24 Standard trachoma baseline, impact, pre-validation surveillance and TT-only surveys are all population-based surveys. These all employ sampling, in which a small proportion of EU residents are selected for examination, using a random or quasi-random sampling technique, with data on individuals examined considered to be representative of the EU population overall. 4. How are survey data processed to generate a TT prevalence estimate? Such an estimate may not represent the true EU-level prevalence in ≥15-year-olds, for two reasons. First, it is rare that everyone resident in selected households is examined: women and older adults are both more likely to be examined in house-to-house surveys, and more likely to have trichiasis, than men and younger adults, respectively. Second, the number of ≥15-year-olds examined in a set number of households (say, n households) in each community varies. Communities in which a greater number of ≥15-year-olds are examined should not contribute more weight to the EU-level prevalence. To compensate, partially, for the first problem (unbalanced recruitment of different age and gender groups), standard trachoma survey analyses adjust the first-stage cluster data by gender and age in five-year age bands. This can be conceptualised as filling in missing data from individuals who were resident in selected households but not examined, using the assumption that their risk of trichiasis was similar to that of residents of similar age and gender who were examined. To compensate for the second problem (varying numbers of individuals examined per cluster), the age- and gender-adjusted first-stage cluster-level TT percentages are averaged to generate the EU-level TT prevalence. This gives equal weight to each of the first stage clusters, as if the same number of ≥15-year-olds had been examined in each one. 5. How accurate are TT prevalence estimates generated from cluster sampled surveys? Chance affects prevalence estimates through sampling variation: if a different sample of 2000 ≥15-year-olds living in the EU had been examined, a different prevalence estimate might have been generated. The chance-induced uncertainty of an estimate produced through sampling can be quantified: it is expressed as a confidence interval. A 95% confidence interval suggests that, based on the observed data, if surveys using the same methodology were repeated multiple times in the EU, in 95% of instances the prevalence estimate would fall between the confidence interval’s lower and upper bounds. Other factors being equal, larger sample sizes will produce narrower confidence intervals. 6. Can data from house-to-house case searches be used to generate a TT prevalence estimate instead? 7. What are known and unknown cases of TT, and why is the distinction important? The trichiasis prevalence threshold for “elimination of trachoma as a public health problem” is a prevalence of TT unknown to the health system in ≥15-year-olds of <0.2%.31 Known cases are people with trichiasis in eyes that have already had surgery for trichiasis, for which surgery has been refused, or for which a surgical date has been agreed. (An aide-memoire for this is: “recurrences, refusals and those already referred”.) In standard trachoma surveys,10,32 when an eye is diagnosed as having trichiasis, the subject is asked if a health worker has ever recommended surgery or epilation for that eye.33 This allows accurate determination of the numerator for estimating the prevalence of TT unknown to the health system, as included in Tropical Data’s expanded trichiasis report (http://tropicaldata.knowledgeowl.com/help/demo-project—expanded-trichiasis-report). 8. What is postoperative TT, and why is this important? Even when surgeons are highly skilled, by 12 months after surgery, at least 8–10% of patients again have TT.34,35 Some of this postoperative TT may be due to under-correction and some to further progression of the underlying scarring processes; the term postoperative TT avoids the need to blame or absolve the surgeon, by simply noting that TT is present after an operation has been performed.36 Postoperative TT is probably not optimally managed by repeating the same procedure that was used to treat primary TT, and should be managed by the most experienced trichiasis surgeon or eye specialist available.36,37 All programmes should have a plan for managing postoperative TT, so the expanded trichiasis report includes specific information to assist. 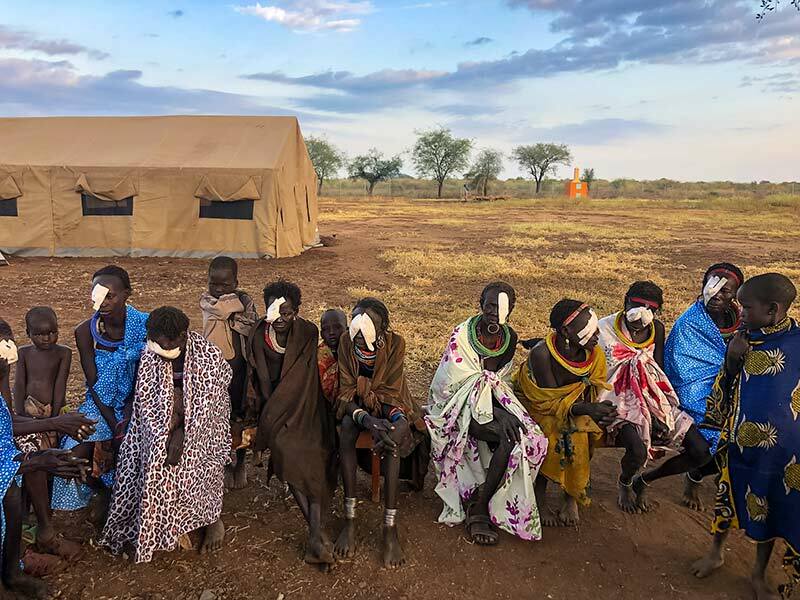 It’s important to note that standard trachoma surveys do not provide information on how often TT surgery is successful, because individuals who have been successfully managed will not be recorded as being any different to those who have never had TT. 9. Why does the expanded trichiasis report also provide data on trichiasis + TS (trichiasis plus trachomatous scarring)? 10. How does the TT prevalence estimate relate to the number of people who need surgery? TT prevalence is useful at EU level for determining whether the TT prevalence criterion for elimination as a public health problem has been reached; if it has not, public health-level TT surgery services, including active case finding, are recommended. For service planning, the number of prevalent cases should be determined by multiplying the TT prevalence in ≥15-year-olds by the number of resident ≥15-year-olds in the EU. It is important to remember that the number of prevalent cases is just an estimate. Programmes should aim to cover the entire EU with case finding and TT management; this may identify considerably more or considerably fewer people with TT than indicated by the estimate. 11. How is the presence of TT in both eyes accounted for? In an individual with TT, one or both eyes may need management. When planning surgical services, a requirement to operate on two eyes rather than one increases (in varying proportions) requirements for selected consumables and operating theatre time. The expanded trichiasis report uses data on the proportion of survey subjects who had bilateral disease to provide an estimate of the number of eyes, as well as the number of people, with TT. 12. Should my estimate of the number of prevalent cases take into account the number of people managed for TT since the most recent prevalence survey? 13. Why aren’t we talking about the TT backlog or the ultimate intervention goal? Each of these terms has been used in different ways by different stakeholders, such that their usefulness as labels has been completely eroded. We do not recommend that these terms be used. 14. Can we eliminate TT by 2020? Yes. Unlike active trachoma – where the dynamics of C. trachomatis transmission39,40 are fundamental to programme impact and accelerated intervention, such as biannual antibiotic mass drug administration, has not been shown to make a programmatically significant difference41 – the rate of decline in TT prevalence is determined by the resources invested. More systematic TT case-finding – plus good access to trained, certified, resourced, and appropriately motivated surgeons and surgical teams – will lead to faster reductions in the numbers of prevalent cases. That is not to say that speed of service delivery is the only important consideration: quality42,43 is also paramount. Vision loss from TT is avoidable. Together, we must do everything we can to consign it to history. 1 Taylor HR, Burton MJ, Haddad D, West S, Wright H. Trachoma. Lancet 2014; 384(9960): 2142-52. 2 Gambhir M, Basanez MG, Burton MJ, et al. The development of an age-structured model for trachoma transmission dynamics, pathogenesis and control. PLoS Negl Trop Dis 2009; 3(6): e462. 3 Courtright P, Rotondo LA, MacArthur C, et al. Strengthening the links between mapping, planning and global engagement for disease elimination: lessons learnt from trachoma. Br J Ophthalmol 2018; 102(10): 1324-7. 4 Smith JL, Haddad D, Polack S, et al. Mapping the global distribution of trachoma: why an updated atlas is needed. PLoS Negl Trop Dis 2011; 5(6): e973. 5 Solomon AW, Pavluck A, Courtright P, et al. The Global Trachoma Mapping Project: methodology of a 34-country population-based study. Ophthalmic Epidemiol 2015; 22(3): 214-25. 6 Solomon AW, Willis R, Pavluck AL, et al. Quality Assurance and Quality Control in the Global Trachoma Mapping Project. Am J Trop Med Hyg 2018; 99(4): 858-63. 7 Hooper PJ, Millar T, Rotondo LA, Solomon AW. Tropical Data: a new service for generating high quality epidemiological data. Community Eye Health 2016; 29(94): 38. 8 Kalua K, Chisambi A, Chainyanya D, et al. One round of azithromycin MDA adequate to interrupt transmission in districts with prevalence of trachomatous inflammation-follicular of 5.0-9.9%: Evidence from Malawi. PLoS Negl Trop Dis 2018; 12(6): e0006543. 9 World Health Organization. Design parameters for population-based trachoma prevalence surveys (WHO/HTM/NTD/PCT/2018.07). Geneva: World Health Organization; 2018. 10 World Health Organization Strategic and Technical Advisory Group on Neglected Tropical Diseases. Design and validation of a trachomatous trichiasis-only survey (WHO/HTM/NTD/PCT/2017.08). Geneva: World Health Organization; 2018. 11 Flueckiger RM, Courtright P, Abdala M, et al. The global burden of trichiasis in 2016. bioRxiv 2018; 348995. 12 World Health Organization. WHO Alliance for the Global Elimination of Trachoma by 2020: progress report on elimination of trachoma, 2017. Wkly Epidemiol Rec 2018; 93(26): 371-80. 13 Dolin PJ, Faal H, Johnson GJ, et al. Reduction of trachoma in a sub-Saharan village in absence of a disease control programme. Lancet 1997; 349(9064): 1511-2. 14 Sokana O, Macleod C, Jack K, et al. Mapping Trachoma in the Solomon Islands: Results of Three Baseline Population-Based Prevalence Surveys Conducted with the Global Trachoma Mapping Project. Ophthalmic Epidemiol 2016; 23(Sup 1): 15-21. 15 Schemann JF, Sacko D, Banou A, et al. [Cartography of trachoma in Mali: results of a national survey]. Bull World Health Organ 1998; 76(6): 599-606. 16 Southisombath K, Sisalermsak S, Chansan P, et al. National Trachoma Assessment in the Lao People’s Democratic Republic in 2013-2014. Ophthalmic Epidemiol 2016; 23(Sup 1): 8-14. 17 Bero B, Macleod C, Alemayehu W, et al. Prevalence of and Risk Factors for Trachoma in Oromia Regional State of Ethiopia: Results of 79 Population-Based Prevalence Surveys Conducted with the Global Trachoma Mapping Project. Ophthalmic Epidemiol 2016; 23(6): 392-405. 18 Mpyet C, Lass BD, Yahaya HB, Solomon AW. Prevalence of and risk factors for trachoma in Kano state, Nigeria. PLoS One 2012; 7(7): e40421. 19 Dirani M, Keel S, Foreman J, van Wijngaarden P, Taylor HR. Prevalence of trachomatous trichiasis in Australia: the National Eye Health Survey. Clin Exp Ophthalmol 2017; 46(1): 13-7. 20 World Health Organization. Report of the 3rd global scientific meeting on trachoma, Johns Hopkins University, Baltimore, MA, 19-20 July 2010 (WHO/PBD/2.10). Geneva: World Health Organization; 2010. 21 Emerson PM, Ngondi J, Biru E, et al. Integrating an NTD with one of “The big three”: combined malaria and trachoma survey in Amhara Region of Ethiopia. PLoS Negl Trop Dis 2008; 2(3): e197. 22 Sherief ST, Macleod C, Gigar G, et al. The Prevalence of Trachoma in Tigray Region, Northern Ethiopia: Results of 11 Population-Based Prevalence Surveys Completed as Part of the Global Trachoma Mapping Project. Ophthalmic Epidemiol 2016; 23(Sup 1): 94-9. 23 Adera TH, Macleod C, Endriyas M, et al. Prevalence of and Risk Factors for Trachoma in Southern Nations, Nationalities, and Peoples’ Region, Ethiopia: Results of 40 Population-Based Prevalence Surveys Carried Out with the Global Trachoma Mapping Project. Ophthalmic Epidemiol 2016; 23(Sup 1): 84-93. 24 Solomon AW, Zondervan M, Kuper H, Buchan JC, Mabey DCW, Foster A. Trachoma control: a guide for programme managers. Geneva: World Health Organization; 2006. 25 Milligan P, Njie A, Bennett S. Comparison of two cluster sampling methods for health surveys in developing countries. Int J Epidemiol 2004; 33(3): 469-76. 26 Abdala M, Singano CC, Willis R, et al. The epidemiology of trachoma in Mozambique: results of 96 population-based prevalence surveys. Ophthalmic Epidemiol 2017; 25(sup1): 201-10. 27 Turner AG, Magnani RJ, Shuaib M. A not quite as quick but much cleaner alternative to the Expanded Programme on Immunization (EPI) Cluster Survey design. Int J Epidemiol 1996; 25(1): 198-203. 28 Macleod C, Yalen C, Butcher R, et al. Eyelash Epilation in the Absence of Trichiasis: Results of a Population-Based Prevalence Survey in the Western Division of Fiji. PLoS Negl Trop Dis 2017; 11(1): e0005277. 29 Engels D. The Global Trachoma Mapping Project: A Catalyst for Progress Against Neglected Tropical Diseases. Ophthalmic Epidemiol 2016; 23(sup1): 1-2. 30 Ministry of Health. Dossier documenting elimination of trachoma as a public health problem: Ghana (available at: https://www.afro.who.int/sites/default/files/2018-07/Ghana%20Trachoma%20Dossier-%20Final%20Document_28_03_2018.pdf accessed 09 July 2018). Accra: Government of Ghana; 2018. 31 World Health Organization. Validation of elimination of trachoma as a public health problem (WHO/HTM/NTD/2016.8). Geneva: World Health Organization; 2016. 32 Courtright P, MacArthur C, Macleod C, et al. Tropical data: training system for trachoma prevalence surveys (version 1) [Available at: http://tropicaldata.knowledgeowl.com/help/training-system-for-trachoma-prevalence-surveys, accessed 30/08/2017]. London: International Coalition for Trachoma Control; 2016. 33 Hiep NX, Ngondi JM, Anh VT, et al. Trachoma in Viet Nam: results of 11 surveillance surveys conducted with the Global Trachoma Mapping Project. Ophthalmic Epidemiol 2018; In press. 34 Habtamu E, Wondie T, Aweke S, et al. Posterior versus bilamellar tarsal rotation surgery for trachomatous trichiasis in Ethiopia: a randomised controlled trial. Lancet Glob Health 2016; 4: e175-84. 35 West S, Alemayehu W, Munoz B, Gower EW. Azithromycin prevents recurrence of severe trichiasis following trichiasis surgery: STAR trial. Ophthalmic Epidemiol 2007; 14(5): 273-7. 36 World Health Organization Alliance for the Global Elimination of Trachoma by 2020. Second Global Scientific Meeting on Trachomatous Trichiasis. Cape Town, 4-6 November 2015 (WHO/HTM/NTD/2016.5). Geneva: World Health Organization; 2016. 37. Solomon AW. Optimising the management of trachomatous trichiasis. Lancet Glob Health 2016; 4(3): e140-1. 38 World Health Organization Strategic and Technical Advisory Group on Neglected Tropical Diseases. Technical consultation on trachoma surveillance. September 11−12, 2014, Task Force for Global Health, Decatur, USA (WHO/HTM/NTD/2015.02). Geneva: World Health Organization; 2015. 39 Migchelsen SJ, Sepulveda N, Martin DL, et al. Serology reflects a decline in the prevalence of trachoma in two regions of The Gambia. Sci Rep 2017; 7(1): 15040. 40 Blake IM, Burton MJ, Bailey RL, et al. Estimating household and community transmission of ocular Chlamydia trachomatis. PLoS Negl Trop Dis 2009; 3(3): e401. 41 Gebre T, Ayele B, Zerihun M, et al. Comparison of annual versus twice-yearly mass azithromycin treatment for hyperendemic trachoma in Ethiopia: a cluster-randomised trial. Lancet 2012;379(9811): 143-51. 42 Gower EW, Kello AB, Kollmann KHM. Training trichiasis surgeons: ensuring quality. Community Eye Health 2014; 27(87): 58. 43 Mpyet C, Kello AB, Solomon AW. Global Elimination of Trachoma by 2020: A Work in Progress. Ophthalmic Epidemiol 2015; 22(3): 148-50.